Morton, J.F. 1980: The Australian pine or beefwood (Casuarina equisetifolia L.) an invasive "weed" tree in Florida. Proceedings of the Florida State Horticultural Society, 93: 87–95. USDA, ARS, Germplasm Resources Information Network. Casuarina equisetifolia in the Germplasm Resources Information Network (GRIN), U.S. Department of Agriculture Agricultural Research Service. Accessed on 07-Oct-06. 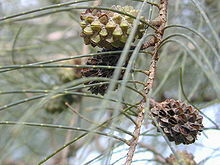 For more multimedia, look at Casuarina equisetifolia on Wikimedia Commons. This page was last edited on 6 March 2019, at 05:47.